Once upon a time long ago (ok, maybe not that long ago) I was a picky eater. Not just a let-me-pick-those-olives-off picky eater, but a oh-my-god-I-cannot-touch-this-because-a-tiny-olive-piece-was-near-it picky eater. Yes, it’s true. I know it’s hard to believe, but this kombucha drinking, raw liver pill taking, fish oil swallowing girl used to like things plain and simple. I’m talking chicken tenders at every restaurant, mayo on absolutely NOTHING, and all tomatoes picked off. Mushrooms were poison, avocados were mushy grossness, and ethnic food was a big N-O. My poor mom hated us kids because we requested the same 4 meals over and over again. And then again the next month. I’m not really sure when, but at some point my taste buds grew up. Slowly, they started appreciating more foods. Now, I love avocados and can’t get enough Thai food. Most importantly though, I have become obsessed with all things buffalo! 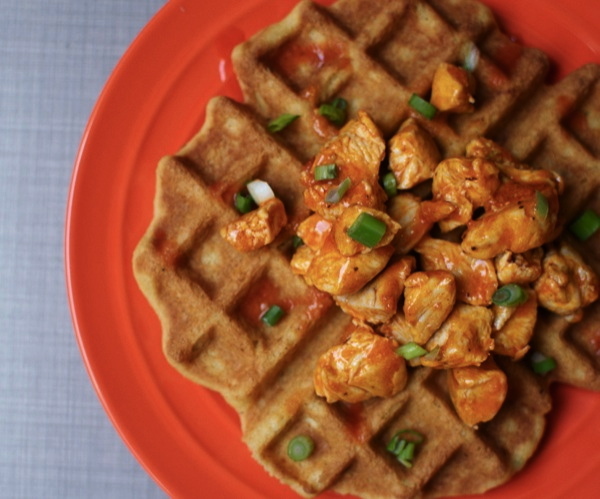 For years, I avoided buffalo wings, buffalo sauce, anything really that involved a bright red peppery sauce. And then I saw the light. Buffalo sauce is now a staple in our house. Frank’s and butter get poured over meats regularly, as well as on eggs and grain-free biscuits. I just can’t stop. 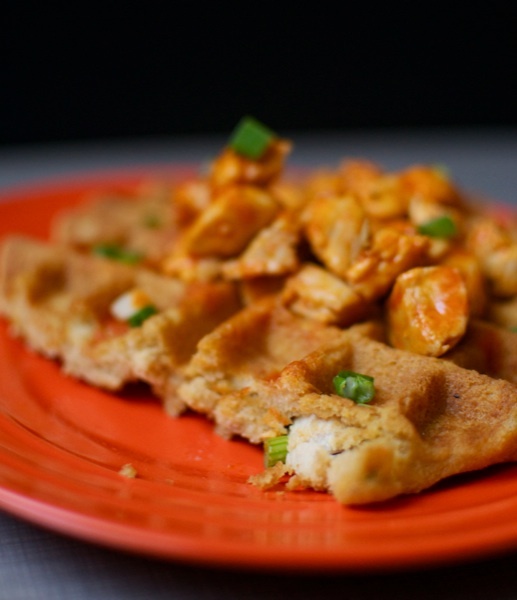 I cut up those spicy tenders and threw them into the day’s waffles. Best decision ever. In a large bowl, mix together the almond flour, tapioca flour, coconut flour, garlic powder, cayenne, and baking soda. In a small bowl, whisk together the eggs, coconut milk, hot sauce and melted butter. Slowly add the wet ingredients to the dry ingredients, stirring to combine. Stir the chicken and green onions into the batter. 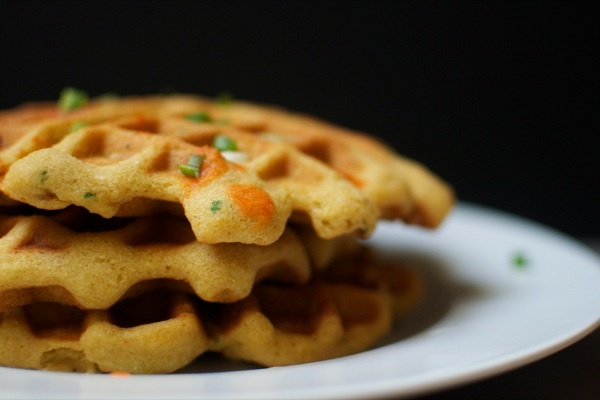 Brush some melted butter onto the top and bottom of the waffle iron and pour about a heaping ½ cup of the batter onto the bottom of the waffle iron (I leave about an inch of space all around the edge of the waffle maker, just filling in the center portion, but your waffle maker may be different!). Close lid and cook according to your waffle maker’s instructions until done and lightly browned (usually until the steam stops). Repeat with the remaining batter until all the waffles have been made. 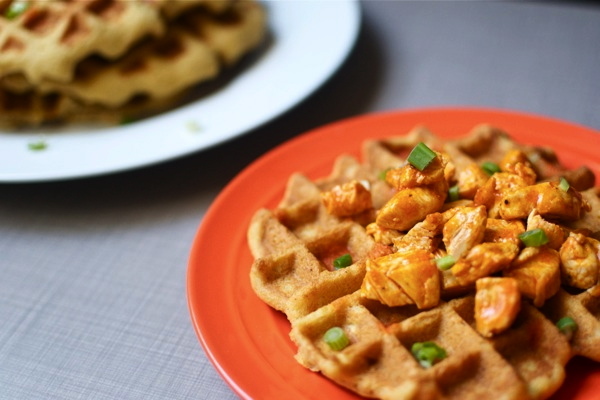 Serve waffles with extra hot sauce and blue cheese if you’re feeling frisky. Yolky eggs are perfect additions as well. I can’t stop munching on these cold, but they also reheat great in a toaster! you’re absolutely amazing. it’s ACTUALLY unreal. oh girl i adore you. i wish we were roomies, neighbours, lived in the same freaking CITY cause we would eat together alllll of theeeee time! these look amazing, must try them!